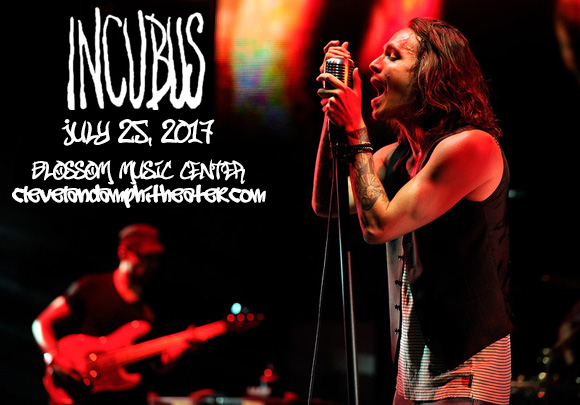 Two major alt-rock bands of the noughties, Incubus & Jimmy Eat World, will be heading to Blossom Music Center on Tuesday 25th July 2017 for one epic night! Incubus are about to release their first studio album since 2011, so expect fresh new material from the band that brought you "Drive", and maybe some of their best-loved hits too! Get ready to rock it out – it's gonna be one awesome show! Multi-platinum-selling rock band Incubus formed in Calabasas, California in 1991. The band released their major label debut, Fungus Amongus, in 1995, followed by 1997's S.C.I.E.N.C.E., but it was Make Yourself (1999) that catapulted the band to the next level of commercial and critical success, launching the singles "Pardon Me", "Stellar", and "Drive", all of which reached the top three of the Billboard Modern Rock Tracks chart, with the latter peaking at number one, as well as reaching number nine on the Billboard Hot 100 chart. 2001's Morning View is the band's biggest-selling record to date, reaching double-platinum sales, and their sixth studio album, Light Grenades, debuted at No. 1 in 2006, earning gold certification in the U.S. The band released their first greatest hits album, Monuments and Melodies, in June 2009, and their most recent album, If Not Now, When?, was released on July 12, 2011. Their eighth studio album, 8, is slated for release in 2017.